Instituto de Hematología e Inmunología » Esta semana en BLOOD; no te lo pierdas! Esta semana en BLOOD; no te lo pierdas! Cover Figure: Review series: 2016 revision of the WHO classification of myeloid and lymphoid neoplasms. See the article by Swerdlow et al. WASHINGTON, May 19, 2016 – Welcome to “This Week in Blood,” a weekly snapshot of the hottest studies from each week’s issue of Blood, the official journal of the American Society of Hematology (ASH), hand-picked by Blood Editor-in-Chief Bob Löwenberg, MD, PhD, and Deputy Editor Nancy Berliner, MD. The most recent World Health Organization classification of Tumours of Haematopoietic and Lymphoid Tissues was published in 2008. The intervening 8 years have seen an explosion of new genetic information about hematopoietic neoplasms that remain to be integrated into diagnostic algorithms for these diseases. Swerdlow and colleagues and Arber and colleagues summarize the revision to the prior classification that incorporates new clinical, prognostic, morphologic, immunophenotypic, and genetic data. Barr and colleagues report the outcome of a phase 2 study of the combination of the phosphatidylinositol 3-kinase δ inhibitor idelalisib and the spleen tyrosine kinase inhibitor entospletinib for the treatment of refractory chronic lymphocytic leukemia and non-Hodgkin lymphoma. Although patients had significant responses, the study was terminated early because of treatment-related pneumonitis occurring in 18% of patients with 2 deaths. Teira and colleagues report a retrospective analysis of the impact of cytomegalovirus (CMV) reactivation on relapse and survival in over 9000 recipients of hematopoietic stem cell transplants. Despite current better treatment regimens directed at the virus, CMV reactivation remains a risk factor for transplant-related mortality. Furthermore, in contrast to some previous studies, CMV is not associated with decreased leukemia relapse. The diagnosis of VWD subtypes remains somewhat challenging, as highlighted in two articles in this week’s issue. In this month’s CME article, Roberts and colleagues report on the development of an enzyme-linked immunosorbent assay–based assay that accurately diagnoses phenotypic subsets of von Willebrand disease (VWD) with over 85-95% accuracy. This rapid test may streamline the appropriate diagnosis of patients with VWD variants. In a second article, Flood and colleagues examine the correlations among the bleeding assessment tool, von Willebrand factor (VWF) levels, and detectable mutations in VWF genes in 482 individuals carrying a diagnosis of type 1 VWD. They report that VWF levels do not predict for bleeding scores, but low VWF levels predict for sequence variants in the VWF gene. Two publications expand our understanding of the genetics of core binding factor acute myeloid leukemia (AML). In the first, Duployez and colleagues performed deep sequencing of 40 known myeloid malignancy–associated genes in over 200 patients with t(8;21) and inv(16) AML, demonstrating that the patterns of mutations in the 2 subtypes are different and pinpointing mutations predictive of poor prognosis in t(8;21). In a letter to Blood, Lavallée and colleagues describe an untargeted RNA-sequencing analysis of 48 samples, identifying novel mutations that could not be predicted by the targeted sequencing approach. 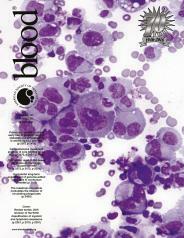 Submit questions or feedback related to “This Week in Blood” or the Blood Journal here. You are receiving this email from the American Society of Hematology in order to keep you updated on top articles published in the most recent issue of Blood selected by its editors. If you wish to unsubscribe from this newsletter, please uncheck the box next to This Week in Blood in the email subscription center. You can access the email subscription center by clicking on the link below.